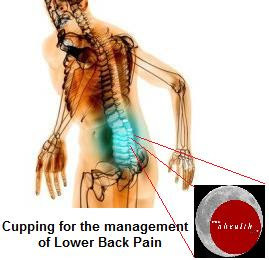 This is a guest-post in the form of a written interview with Anjum Shahzad – a male cupping therapist based in London, England, about his experience of treating his lower back pain with hijama which inspired him to become a hijama therapist. – What condition did you suffer from? Lower Back Pain was a problem I had for many years. This was due to my lifestyle choices. I’d drive for an hour to work and back and I’d sit at work , on a desk, for the whole day. With the routine alot of pressure was applied to my back and caused immense inconvenience and trouble. I tried acupunture which I received mixed results. Any relief was short – lived. I needed something that was more permanent and long lasting. Also I was taking pain killers which didn’t resolve the issue – it just numbed the pain. – What did the treatment involve for lower back pain? Focusing on the pain area, certain meridian points (energy) are treated. Here clot is removed which contains inflamed blood as a result of pain. Also pressure is released which re-balances the energy on the lower back area due to stress and awkward positioning because of unhealthy lifestyle choices. The aim is to cause balance and order in the body – to bring it back to its default , optimum condition. The result is lower back feels light, pain relief and all round comfortable feeling on the body. As a result of pain relief , it strengthened my belief in this wonderful treatment. It inspired me to become a hijamah therapist with the aim to help people regardless of race, creed and religious viewpoints to lead healthier lives with the use of alternative, natural and effective treatment. This treatment is Hijamah – Alhumdulillah! – Where do you live and what other services you provide? I am based in East London and also provide home visits to treat all kinds of symptoms including lower back pain. Due to demand, I also provide ruqyah treatment in the form of honey mixture with the ingredients that are sunnah of Prophet pbuh and it has ruqyah blown on it to provide protection from black magic, evil eye and jinns.